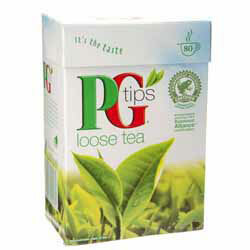 250g of Loose Tea - enough loose tea for approximately 80 cups of tea. "Dear Spices of India, Just a note to say thank-you for your prompt delivery. I placed an order on Sunday night and received it before 12 midday on Tuesday. I have just started to try indian cooking and will use your site again and again as my skills progress. Today I am attempting Haggis Pakora so well see how it turns out. Thank-you once again and I will be giving your email addy to anyone who asks."